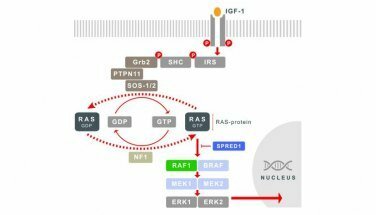 RAS genes play an important role in the mitogen-activated protein kinase-dependent signaling pathway (MAPK), a metabolic pathway that regulates cell proliferation, differentiation, survival and death or apoptosis. Germinal mutations described in some of these genes cause developmental anomalies in the subject (depending on the affected gene), which often overlap clinically, with an autosomal dominant inheritance pattern. Therefore, all patients share a variable degree of intellectual disability, cardiac anomalies, facial dysmorphism, skin anomalies and predisposition to develop cancer. In recent years, this group of pathologies has been known as “RASopathies”. The most widely known pathology in this group is Noonan syndrome, with an estimated incidence between 1/1,000 and 1/2,500 live births. Subjects under suspicion or clinical diagnosis of Noonan, LEOPARD, Costello, Legius or cardiofaciocutaneous syndrome. There is frequent clinical overlapping among these syndromes (these patients share a variable degree of intellectual disability, cardiac anomalies, facial dysmorphism, skin anomalies and predisposition to develop cancer); therefore the genetic study would facilitate differential diagnosis. All these syndromes share an autosomal dominant pattern. Familial study: A search for the mutation previously identified in a proband (relatives of patients with Noonan, LEOPARD, Costello, Legius or cardiofaciocutaneous syndrome, in which a mutation has been previously identified. Noonan syndrome: short size (40%-50%), facial dysmorphism (hypertelorism, antimongoloid palpebral fissures, ptosis, low-set and posteriorly rotated ears, etc. ), short neck, cardiac abnormalities [50%-80%, pulmonary valve stenosis (20%-50%), hypertrophic cardiomyopathy (HCM) (20%-30%) and other structural defects], developmental abnormalities, a variable degree of intellectual disability (25%), thoracic abnormalities (pectus carinatum or pectus excavatum) or coagulation disorders (platelet count, prothrombin time, partial thromboplastin time, etc. ), and cryptorchidism in men (60%-80% with deficient spermatogenesis). These patients present a higher risk of developing cancer depending on the mutated gene (see the “Prognostic value” section).A mutation in PTPN11 gene is identified in 50% of patients, 13% in SOS1, 3%-17% in RAF1, 5% in KRAS, and <2% in BRAF, NRAS and MAP2K1. LEOPARD syndrome: short size (50%), facial dysmorphism (hypertelorism, antimongoloid palpebral fissures, ptosis, low-set and posteriorly rotated ears, etc. ), café au lait spots (70%), lentigines (3%-10%), cardiac abnormalities [85%, hypertrophic cardiomyopathy (70%), pulmonary valve stenosis (25%)], developmental abnormalities, thoracic abnormalities (pectus carinatum or pectus excavatum), a variable degree of intellectual disability (30%), neurosensorial hearing loss, skeletal abnormalities, and cryptorchidism in men. Diagnostic suspicion when lentigines and at least 2 of the aforementioned characteristics are observed or 3 characteristics in the absence of lentigines. These patients present a higher risk of developing cancer depending on the mutated gene (see the “Prognostic value” section). A mutation in PTPN11 is identified in 90% of patients, <5% in RAF1, and <2% in BRAF and MAP2K1. Costello syndrome: polyhydramnios, short size, macrocephalia (relative), scarce, thin and wavy hair, facial dysmorphism (coarse facies), intellectual disability, skin pigmentation abnormalities, skeletal abnormalities and cardiac abnormalities (hypertrophic cardiomyopathy, pulmonary valve stenosis, arrhythmias and aortic dilatation). There is a risk of developing benign and malignant tumors in patients with this syndrome. The accumulated incidence of cancer (more frequently rhabdomyosarcoma, followed by neuroblastoma, transitional bladder cell carcinoma and other solid tumors) in subjects with mutations in HRAS is approximately 15% at the age of 20. A mutation in HRAS is identified in 80%-90% of patients. Legius syndrome: skin pigmentation abnormalities (café au lait spots, intertriginous freckling), short size (30%), macrocephalia, thoracic abnormalities (pectus carinatum or pectus excavatum), characteristics of neurofibromatosis type 1 (Lisch nodules, optic nerve glioma, neurofibromas, long bone dysplasia), vascular abnormalities and some relatives presenting café au lait spots without any other characteristics of neurofibromatosis. Some studies have suggested that these patients show a higher risk of developing leukemia (acute myeloblastic leukemia). A mutation in SPRED1 is found in 88%-98% of patients. Cardiofaciocutaneous syndrome: craniofacial abnormalities (relative macrocephaly, hypertelorism, telecanthus, epicanthus, ptosis, ocular abnormalities, coarse facies, low-set and posteriorly-rotated ears, deep nasolabial folds, high-arched palate, micrognathia, etc. ), cardiac abnormalities (pulmonary stenosis, septal defects, hypertrophic cardiomyopathy, valvular abnormalities), skin abnormalities (xerosis, hyperkeratosis, ichthyosis, keratosis pilaris, eczema, hemangiomas, café au lait spots, erythema, etc. ), hair abnormalities, nail abnormalities, endocrine abnormalities, skeletal abnormalities and some lymphatic abnormalities. The risk of malignancy can be increased in this syndrome. In some patients, mutations in acute lymphoblastic leukemia, non-Hodgkin lymphoma and large B-cell lymphoma have been observed. A mutation in BRAS is identified in 75% of patients, 25% in MAP2K1 and MAP2K2 and <3% in KRAS. Regarding HCM: age of presentation of this pathology is highly variable (can occur in neonatal period, infancy or adolescence) and depends on the causing gene and mutation. In most cases it constitutes a part of the natural evolution of the disease, developing later in life with a variable degree of severity. Regarding cancer: since most mutations involved in the development of these syndromes frequently cause a gain of function of the RAS/MAPKpathway and, to a lesser extent, a loss of function of this pathway, there is a risk or predisposition to develop cancer in these patients (pancreatic, colon, thyroid, and lung cancer and melanoma). The genes clearly identified as tumorigenic are in the RAS family. Mutations associated with cancer are frequently detected in KRAS (85%) and NRAS(15%) and much more rarely in HRAS (<1%). Mutations in NRAS have also been found in cases of acute non-lymphoid leukemias. Somatic mutations in PTPN11 have been identified in patients with juvenile myelomonocytic leukemia, acute lymphoblastic leukemia and acute myeloid leukemia. Somatic mutations in RAF1 have also been associated with cancer. Finally, mutations in KRAS are associated with a bad prognosis. The probability of identifying a causative mutation when a patient has been diagnosed with one of these syndromes is high, over 70% in all cases. It can range from 70%-80% for one mutation or variant relevant for Noonan syndrome, to 88%-98% in the case of Legius syndrome. Priority Genes: These genes include >70% of the mutations that have been previously associated with the development of a RASopathy and/or their testing is recommended by the guidelines. Secondary genes: Other genes related to the disease. *Candidate genes: With no evidence, but likely to be related to the phenotype.